I senaste numret av ETC finns det en artikel om KLASS och föreningen Arbetarskrivare. ”….Klass, som ges ut fyra gånger per år, görs för att passa både som medlemstidning och för att kunna läsas av alla som är intresserade av ämnesområdet, men har sedan den kom till också lett till ett ökat medlemsantal. 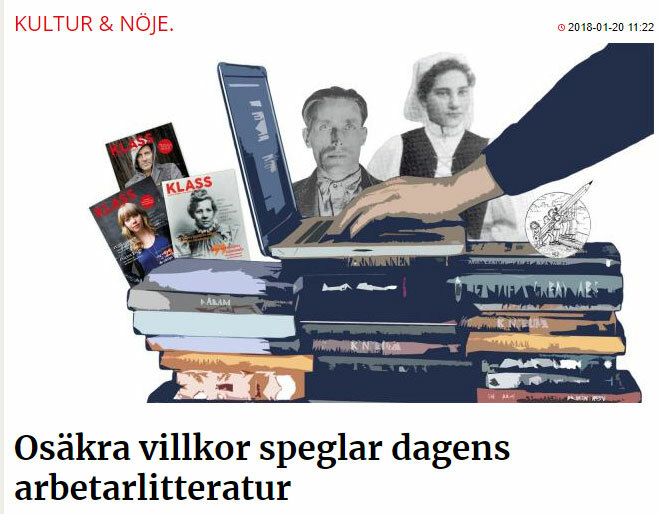 Bland de tolv nummer som hittills har kommit ut av tidskriften finns ett temanummer om Joe Hill medan andra nummer har rört sig lite i området runt arbetarlitteratur, genom att till exempel ta upp arbetarkonst. Men mest handlar tidningen om de litterära genrer som fått namnet arbetarlitteratur, där varje nummer innehåller artiklar, -reportage, recensioner men också publicerade texter i form av noveller, dikter och ibland också sångtexter. Nutida författare som presenterats är bland annat Anna Jörgensdotter, Kjell Johansson, Doris Dahlin och Anamarija Todorov. Bland klassikerna finns Per-Anders Fogelström och Stig Sjödin. Utblickar görs också mot liknande litteratur på andra håll i världen. I just want to tell you that I am new to blogging and site-building and honestly loved your blog. Probably I’m planning to bookmark your blog post . You actually have tremendous writings. Thank you for revealing your web page. Great ¡V I should certainly pronounce, impressed with your website. I had no trouble navigating through all tabs and related information ended up being truly easy to do to access. I recently found what I hoped for before you know it at all. Reasonably unusual. Is likely to appreciate it for those who add forums or something, website theme . a tones way for your client to communicate. Nice task.. I must express my respect for your kind-heartedness giving support to men and women who need guidance on the content. Your very own dedication to getting the solution all through ended up being extraordinarily useful and has continually enabled associates like me to achieve their endeavors. Your amazing informative suggestions indicates this much a person like me and substantially more to my mates. Regards; from everyone of us. I have to get across my love for your kind-heartedness for persons who have the need for help on this situation. Your very own commitment to getting the solution all around was remarkably invaluable and has helped guys much like me to get to their objectives. The important instruction signifies this much a person like me and still more to my fellow workers. Thank you; from each one of us. Wonderful web site. A lot of useful info here. I am sending it to a few buddies ans additionally sharing in delicious. And obviously, thank you on your sweat! Thank you, I have just been searching for information approximately this subject for ages and yours is the greatest I have discovered so far. But, what concerning the conclusion? Are you sure concerning the supply? Thank you for sharing excellent informations. Your site is so cool. I’m impressed by the details that you¡¦ve on this blog. It reveals how nicely you perceive this subject. Bookmarked this web page, will come back for more articles. You, my pal, ROCK! I found simply the information I already searched everywhere and just couldn’t come across. What a great site. I was just seeking this information for some time. After six hours of continuous Googleing, finally I got it in your web site. I wonder what’s the lack of Google strategy that don’t rank this kind of informative web sites in top of the list. Normally the top websites are full of garbage. Thanks a lot for giving everyone an exceptionally superb possiblity to read critical reviews from this site. It is often so pleasant plus jam-packed with a great time for me personally and my office colleagues to visit your blog at the very least 3 times every week to read the fresh things you have got. Of course, I am actually motivated with all the remarkable solutions you serve. Some 1 points in this posting are basically the finest we’ve had. I simply wished to thank you so much all over again. I’m not certain what I could possibly have worked on without these advice contributed by you about that area. It had become a fearsome case for me personally, however , being able to see a new specialized avenue you managed it made me to leap over fulfillment. Extremely grateful for your assistance and then sincerely hope you know what an amazing job you are providing training the rest by way of your web page. Probably you have never come across any of us. of course like your web site but you have to test the spelling on quite a few of your posts. Several of them are rife with spelling issues and I in finding it very bothersome to inform the reality on the other hand I¡¦ll surely come again again. Wow, awesome blog structure! How long have you ever been blogging for? you make blogging glance easy. The full glance of your site is fantastic, as well as the content! Hiya, I’m really glad I’ve found this information. Today bloggers publish only about gossips and net and this is really irritating. A good blog with exciting content, this is what I need. Thank you for keeping this web site, I’ll be visiting it. Do you do newsletters? Can not find it. Just wish to say your article is as astonishing. The clarity in your post is just cool and i could assume you are an expert on this subject. Well with your permission allow me to grab your feed to keep up to date with forthcoming post. Thanks a million and please keep up the gratifying work. Hello, Neat post. There’s a problem together with your site in web explorer, could check this¡K IE nonetheless is the market chief and a good component of people will miss your wonderful writing because of this problem. Thank you, I have recently been searching for info about this topic for a long time and yours is the best I’ve found out so far. However, what in regards to the bottom line? Are you sure concerning the source? I actually wanted to write down a simple comment to be able to thank you for those magnificent suggestions you are placing on this site. My time consuming internet look up has at the end been rewarded with pleasant concept to write about with my company. I ’d assert that many of us readers are very much fortunate to exist in a fine community with many marvellous people with very helpful plans. I feel extremely privileged to have used your entire webpage and look forward to tons of more brilliant minutes reading here. Thanks once again for everything. hey there and thank you for your info – I’ve definitely picked up something new from right here. I did however expertise some technical issues using this web site, as I experienced to reload the web site lots of times previous to I could get it to load correctly. I had been wondering if your hosting is OK? Not that I’m complaining, but sluggish loading instances times will often affect your placement in google and could damage your quality score if ads and marketing with Adwords. Anyway I am adding this RSS to my email and can look out for a lot more of your respective exciting content. Ensure that you update this again soon.. Very well written post. It will be valuable to anybody who employess it, including me. Keep up the good work – can’r wait to read more posts. My spouse and i were really more than happy when Michael managed to deal with his research through your precious recommendations he got in your web page. It’s not at all simplistic to just always be freely giving ideas which some other people might have been selling. Therefore we take into account we have got the writer to thank for this. The most important illustrations you have made, the simple website navigation, the relationships your site help create – it’s got everything powerful, and it is letting our son and the family believe that that idea is enjoyable, which is certainly truly essential. Many thanks for all! Hiya, I’m really glad I have found this info. Nowadays bloggers publish just about gossips and web and this is actually annoying. A good website with interesting content, that’s what I need. Thanks for keeping this web site, I’ll be visiting it. Do you do newsletters? Can’t find it. Thanks a lot for providing individuals with remarkably memorable opportunity to check tips from this web site. It’s always very amazing and packed with a good time for me and my office colleagues to search your site at a minimum three times every week to read through the newest tips you have got. Of course, I’m also certainly impressed concerning the wonderful secrets you give. Some 3 areas on this page are completely the best we have all had. Needed to create you a bit of word to be able to say thanks a lot as before just for the pleasant ideas you have featured on this website. This has been simply pretty open-handed of you to grant freely exactly what many of us would have advertised for an e-book to make some money on their own, primarily since you could possibly have done it in the event you desired. The creative ideas also acted like the fantastic way to realize that other people have the identical zeal like my own to find out a great deal more with regard to this issue. I believe there are lots of more fun times in the future for individuals that read through your blog. Needed to send you a little bit of word to thank you very much again considering the breathtaking tricks you’ve featured above. It has been simply shockingly open-handed with you to provide freely just what some people could have distributed as an electronic book to help with making some cash on their own, chiefly now that you could possibly have done it if you considered necessary. The tricks additionally acted to be the easy way to understand that the rest have the identical eagerness much like my very own to know great deal more on the topic of this problem. I’m certain there are thousands of more enjoyable periods in the future for folks who discover your blog. Nice post. I was checking constantly this blog and I’m impressed! Very useful information particularly the last part 🙂 I care for such information much. I was looking for this certain information for a very long time. Thank you and good luck. Great web site. A lot of useful information here. I¡¦m sending it to a few pals ans additionally sharing in delicious. And naturally, thanks on your sweat! Hey very cool blog!! Guy .. Excellent .. Wonderful .. I will bookmark your site and take the feeds also¡KI am satisfied to seek out a lot of helpful info here in the publish, we need work out extra techniques in this regard, thank you for sharing. . . . . . Thank you, I have recently been seeking for information about this subject matter for ages and yours is the best I’ve discovered so far. I am only commenting to let you know of the impressive encounter my friend’s princess found visiting your web page. She realized plenty of pieces, which include how it is like to possess an awesome helping spirit to get certain people with no trouble know just exactly certain hard to do matters. You truly exceeded our own expectations. Many thanks for imparting such essential, trusted, educational as well as fun tips on the topic to Sandra. Magnificent goods from you, man. I’ve understand your stuff previous to and you’re just extremely fantastic. I really like what you have acquired here, really like what you are stating and the way in which you say it. You make it entertaining and you still care for to keep it sensible. I can not wait to read far more from you. This is really a wonderful website. I’ve read a few excellent stuff here. Certainly worth bookmarking for revisiting. I wonder how so much attempt you place to make the sort of fantastic informative website. Thanks for your entire efforts on this blog. Kate enjoys setting aside time for research and it’s simple to grasp why. We all hear all about the compelling medium you produce practical thoughts through your blog and as well increase contribution from other people on that idea then our simple princess is always understanding a lot. Take advantage of the rest of the year. You have been performing a superb job. obviously like your web-site however you have to take a look at the spelling on quite a few of your posts. Several of them are rife with spelling issues and I in finding it very bothersome to tell the truth then again I will certainly come back again. Someone essentially help to make severely posts I would state. This is the first time I frequented your web page and to this point? I surprised with the research you made to create this particular publish incredible. Great process! My husband and i ended up being very fortunate that Louis could finish up his investigation by way of the precious recommendations he gained out of your web site. It is now and again perplexing just to be giving out guides which often other people have been trying to sell. So we do understand we have got the writer to thank for that. The type of illustrations you have made, the simple blog menu, the relationships your site make it easier to instill – it’s got mostly spectacular, and it’s facilitating our son and the family do think the matter is thrilling, which is extraordinarily vital. Thank you for the whole lot! Hello there, I discovered your web site by way of Google at the same time as searching for a similar matter, your website got here up, it appears to be like good. I have bookmarked it in my google bookmarks. Great amazing issues here. I¡¦m very happy to see your post. Thank you a lot and i’m taking a look forward to touch you. Will you please drop me a e-mail? Usually I do not read article on blogs, however I would like to say that this write-up very compelled me to check out and do it! Your writing style has been amazed me. Thank you, quite great post. Some genuinely good info , Gladiola I found this. ”Men in no way approach so nearly to the gods as in doing good to men.” by Marcus Tullius Cicero. Somebody necessarily assist to make critically posts I would state. That is the very first time I frequented your web page and to this point? I amazed with the analysis you made to create this actual post amazing. Wonderful task! I¡¦m not certain the place you are getting your information, but good topic. I must spend a while finding out much more or figuring out more. Thank you for excellent info I used to be on the lookout for this info for my mission. I have learn a few good stuff here. Certainly value bookmarking for revisiting. I surprise how much effort you set to create this kind of wonderful informative site. Thank you for another informative site. The place else may I am getting that type of information written in such a perfect method? I’ve a mission that I’m simply now running on, and I have been on the look out for such info. F*ckin’ remarkable issues here. I am very happy to see your post. Thank you so much and i’m looking ahead to contact you. Will you please drop me a e-mail? I intended to put you the bit of observation to finally give thanks again for all the awesome views you have provided above. It is so unbelievably generous with you to deliver unhampered exactly what many people would’ve marketed as an electronic book to help make some dough on their own, specifically considering the fact that you could have tried it in case you desired. The pointers also served as the easy way to realize that some people have the same passion really like my own to learn a good deal more with regards to this matter. I’m sure there are several more pleasant sessions ahead for individuals that read carefully your blog. whoah this weblog is fantastic i like reading your articles. Stay up the great work! You already know, lots of people are looking around for this info, you can help them greatly. Thank you for all your effort on this web site. My mom delights in participating in investigations and it’s easy to see why. Almost all know all about the compelling method you create both interesting and useful tips and tricks via the blog and as well as recommend response from others about this concept plus our favorite girl is always learning a whole lot. Take advantage of the rest of the new year. Your performing a glorious job. Excellent read, I just passed this onto a colleague who was doing some research on that. And he actually bought me lunch as I found it for him smile So let me rephrase that: Thank you for lunch! ”Whenever you have an efficient government you have a dictatorship.” by Harry S Truman. Wow, amazing blog format! How lengthy have you been blogging for? you made blogging look easy. The overall look of your website is magnificent, as smartly as the content material! Needed to compose you this very little note so as to thank you once again with your pleasing principles you’ve shown at this time. It was really wonderfully open-handed of people like you to present openly what exactly many of us could possibly have supplied as an e-book to end up making some cash for their own end, particularly now that you might well have done it if you desired. Those thoughts also served to be the good way to recognize that other people online have the same dream just as my own to figure out way more in regard to this issue. I am sure there are thousands of more enjoyable situations ahead for folks who scan through your blog post. But wanna remark on few general things, The website design and style is perfect, the written content is real excellent. ”Art for art’s sake makes no more sense than gin for gin’s sake.” by W. Somerset Maugham. you are really a good webmaster. The site loading speed is incredible. It kind of feels that you’re doing any distinctive trick. Also, The contents are masterpiece. you’ve done a wonderful job in this topic! Good ¡V I should definitely pronounce, impressed with your web site. I had no trouble navigating through all tabs and related info ended up being truly easy to do to access. I recently found what I hoped for before you know it at all. Reasonably unusual. Is likely to appreciate it for those who add forums or something, website theme . a tones way for your client to communicate. Nice task..
It¡¦s actually a cool and helpful piece of info. I am happy that you just shared this useful info with us. Please stay us up to date like this. Thank you for sharing. Helpful info. Lucky me I found your website by chance, and I am stunned why this twist of fate didn’t came about in advance! I bookmarked it. Hello there, I discovered your web site by the use of Google whilst looking for a similar subject, your site got here up, it seems to be great. I’ve bookmarked it in my google bookmarks. Thanks for sharing excellent informations. Your web-site is so cool. I’m impressed by the details that you¡¦ve on this blog. It reveals how nicely you understand this subject. Bookmarked this website page, will come back for extra articles. You, my friend, ROCK! I found simply the info I already searched everywhere and simply could not come across. What a great web site. Merely a smiling visitor here to share the love (:, btw outstanding style. ”He profits most who serves best.” by Arthur F. Sheldon. Thanks , I have recently been looking for information approximately this subject for a while and yours is the greatest I’ve came upon till now. But, what in regards to the conclusion? Are you positive concerning the source? whoah this weblog is excellent i really like reading your posts. Stay up the good paintings! You already know, many individuals are searching round for this information, you could aid them greatly. What i don’t realize is actually how you are now not actually a lot more neatly-appreciated than you might be now. You’re so intelligent. You know thus considerably in relation to this subject, made me for my part imagine it from numerous numerous angles. Its like women and men don’t seem to be fascinated except it is something to accomplish with Woman gaga! Your individual stuffs great. All the time care for it up! Hello very cool web site!! Man .. Excellent .. Wonderful .. I’ll bookmark your blog and take the feeds additionally…I’m glad to find so many helpful information right here within the put up, we need work out extra strategies in this regard, thank you for sharing. It¡¦s truly a nice and useful piece of info. I¡¦m glad that you simply shared this helpful information with us. Please stay us up to date like this. Thanks for sharing. of course like your web-site however you have to test the spelling on several of your posts. Many of them are rife with spelling issues and I to find it very troublesome to tell the truth then again I will surely come back again. Thank you for another informative site. Where else may I am getting that kind of information written in such an ideal manner? I’ve a venture that I’m simply now operating on, and I have been on the look out for such info. Hello there, I discovered your blog via Google while looking for a comparable subject, your site came up, it seems great. I’ve bookmarked it in my google bookmarks. wonderful put up, very informative. I’m wondering why the opposite experts of this sector don’t notice this. You must proceed your writing. I’m confident, you’ve a great readers’ base already! I would like to thank you for the efforts you have put in writing this blog. I am hoping the same high-grade blog post from you in the upcoming as well. Actually your creative writing skills has inspired me to get my own web site now. Actually the blogging is spreading its wings rapidly. Your write up is a great example of it. Thanks a lot for sharing this with all of us you really know what you are talking about! Bookmarked. Kindly also talk over with my web site =). We may have a hyperlink alternate arrangement between us! I want to get across my gratitude for your kindness in support of visitors who really need help with your theme. Your personal dedication to passing the message all around came to be certainly advantageous and have continuously encouraged somebody much like me to arrive at their desired goals. Your entire insightful useful information denotes a whole lot to me and far more to my colleagues. Many thanks; from all of us. You actually make it seem so easy along with your presentation however I find this topic to be really one thing which I feel I might by no means understand. It kind of feels too complicated and very large for me. I’m taking a look ahead in your next put up, I¡¦ll try to get the dangle of it! Wow, marvelous weblog structure! How lengthy have you been blogging for? you make running a blog look easy. The entire look of your site is fantastic, let alone the content! Hello, Neat post. There’s an issue with your web site in web explorer, would check this¡K IE nonetheless is the marketplace chief and a huge part of other people will miss your magnificent writing due to this problem. I wanted to send you that very small remark to help say thanks a lot over again considering the wonderful solutions you’ve featured on this page. It’s open-handed with you to allow without restraint all that a number of people could possibly have marketed for an ebook to earn some cash for themselves, especially considering that you might have done it if you ever considered necessary. These suggestions likewise served to provide a great way to fully grasp some people have a similar keenness just like mine to grasp a good deal more on the topic of this problem. I believe there are many more fun periods up front for those who looked at your blog. Needed to put you this little bit of observation just to give thanks over again for your pleasant tricks you have shown above. It is quite wonderfully generous with you to offer publicly what a few people might have marketed for an electronic book to get some profit for their own end, primarily considering the fact that you might well have tried it in case you decided. Those things also acted to provide a easy way to know that other people have the identical zeal just like my personal own to find out a great deal more on the topic of this issue. Certainly there are a lot more fun occasions up front for those who read carefully your website. A person essentially lend a hand to make significantly articles I would state. That is the first time I frequented your web page and so far? I amazed with the research you made to make this actual put up incredible. Great task! Whats Happening i am new to this, I stumbled upon this I’ve discovered It absolutely helpful and it has helped me out loads. I am hoping to contribute & help different customers like its helped me. Great job. I am not sure the place you’re getting your info, however good topic. I must spend a while learning more or understanding more. Thanks for magnificent info I used to be in search of this info for my mission. Just want to say your article is as surprising. The clearness in your post is simply spectacular and i could assume you’re an expert on this subject. Fine with your permission allow me to grab your RSS feed to keep updated with forthcoming post. Thanks a million and please continue the enjoyable work. I was just searching for this information for some time. After six hours of continuous Googleing, at last I got it in your web site. I wonder what is the lack of Google strategy that don’t rank this type of informative sites in top of the list. Generally the top sites are full of garbage. Utterly written content material, thank you for selective information. ”The last time I saw him he was walking down Lover’s Lane holding his own hand.” by Fred Allen. Good ¡V I should certainly pronounce, impressed with your website. I had no trouble navigating through all the tabs as well as related info ended up being truly simple to do to access. I recently found what I hoped for before you know it in the least. Reasonably unusual. Is likely to appreciate it for those who add forums or something, site theme . a tones way for your client to communicate. Excellent task.. Helpful information. Fortunate me I found your website by chance, and I’m surprised why this twist of fate didn’t took place earlier! I bookmarked it. Simply want to say your article is as surprising. The clarity in your post is just great and i could assume you’re an expert on this subject. Well with your permission let me to grab your feed to keep updated with forthcoming post. Thanks a million and please carry on the gratifying work. you’re in point of fact a just right webmaster. The web site loading speed is incredible. It seems that you are doing any distinctive trick. Moreover, The contents are masterwork. you have performed a great process on this matter! I wanted to send you a tiny note in order to say thanks yet again with the fantastic tactics you’ve shared on this site. It’s seriously open-handed of you to grant unhampered all that most people could possibly have advertised as an electronic book to generate some profit on their own, precisely given that you might have done it if you ever considered necessary. These inspiring ideas also served to be a easy way to recognize that someone else have a similar interest like my very own to learn good deal more regarding this matter. I am certain there are numerous more fun sessions in the future for those who examine your site. I have learn some just right stuff here. Certainly price bookmarking for revisiting. I wonder how much attempt you place to create this type of magnificent informative site. I actually wanted to compose a small note so as to express gratitude to you for all of the lovely ways you are posting at this site. My rather long internet investigation has at the end been compensated with pleasant information to share with my colleagues. I would assert that we site visitors are undoubtedly lucky to be in a good website with very many special people with interesting tips and hints. I feel truly privileged to have discovered your entire webpages and look forward to so many more cool times reading here. Thanks a lot once more for everything. Thanks so much for giving everyone such a pleasant opportunity to read articles and blog posts from this web site. It’s usually very excellent and also full of a good time for me personally and my office fellow workers to visit the blog not less than three times in one week to study the fresh stuff you have got. And definitely, we’re certainly contented with your remarkable opinions you serve. Some 4 areas in this posting are rather the finest we’ve ever had. Excellent goods from you, man. I have understand your stuff previous to and you’re just too great. I actually like what you’ve acquired here, really like what you are saying and the way in which you say it. You make it enjoyable and you still take care of to keep it smart. I can not wait to read far more from you. This is really a wonderful web site. I do trust all the ideas you’ve presented in your post. They’re very convincing and can certainly work. Still, the posts are too short for beginners. May you please lengthen them a little from subsequent time? Thanks for the post. Thanks for helping out, great information. ”Whoever obeys the gods, to him they particularly listen.” by Homer. Thanks for some other magnificent post. The place else may just anyone get that type of info in such a perfect approach of writing? I have a presentation next week, and I am on the search for such information. I have been exploring for a little for any high quality articles or blog posts in this kind of space . Exploring in Yahoo I at last stumbled upon this web site. Reading this information So i am satisfied to show that I’ve an incredibly excellent uncanny feeling I found out exactly what I needed. I most definitely will make certain to do not overlook this site and provides it a glance regularly. obviously like your website however you have to check the spelling on quite a few of your posts. A number of them are rife with spelling problems and I find it very troublesome to inform the truth however I¡¦ll certainly come again again. Hi there, I found your site by the use of Google while looking for a comparable topic, your site came up, it looks good. I have bookmarked it in my google bookmarks. Excellent goods from you, man. I’ve understand your stuff previous to and you are just extremely wonderful. I actually like what you’ve acquired here, certainly like what you are saying and the way in which you say it. You make it enjoyable and you still care for to keep it sensible. I can not wait to read much more from you. This is really a tremendous website. Fantastic goods from you, man. I’ve understand your stuff previous to and you are just too wonderful. I actually like what you’ve acquired here, really like what you are stating and the way in which you say it. You make it entertaining and you still take care of to keep it sensible. I can’t wait to read far more from you. This is actually a tremendous site. Someone essentially lend a hand to make severely posts I might state. That is the very first time I frequented your web page and to this point? I amazed with the research you made to create this particular put up amazing. Excellent job! Keep up the excellent piece of work, I read few articles on this web site and I think that your weblog is rattling interesting and holds sets of good information. of course like your web site however you have to check the spelling on quite a few of your posts. Several of them are rife with spelling issues and I find it very troublesome to inform the reality on the other hand I will surely come back again. I really enjoy examining on this internet site, it has got great blog posts. ”Don’t put too fine a point to your wit for fear it should get blunted.” by Miguel de Cervantes. Very interesting subject , thanks for putting up. ”Nobody outside of a baby carriage or a judge’s chamber believes in an unprejudiced point of view.” by Lillian Hellman. I have read several good stuff here. Certainly value bookmarking for revisiting. I wonder how much attempt you place to make this sort of wonderful informative site. I just could not depart your website before suggesting that I really loved the usual information a person supply on your guests? Is gonna be again often to investigate cross-check new posts. you’re really a just right webmaster. The site loading speed is amazing. It seems that you are doing any unique trick. Moreover, The contents are masterpiece. you have performed a excellent activity in this subject! I intended to post you a little bit of remark to help thank you very much once again considering the extraordinary concepts you have provided at this time. This is quite extremely open-handed with you to deliver easily just what many individuals could possibly have made available for an e-book to help with making some cash for themselves, most notably considering the fact that you might well have tried it in the event you wanted. The pointers in addition served to become a great way to realize that other individuals have a similar dreams like mine to find out many more pertaining to this matter. I think there are some more fun instances ahead for folks who find out your site. Hiya, I am really glad I’ve found this information. Nowadays bloggers publish only about gossips and net and this is really irritating. A good website with exciting content, that’s what I need. Thanks for keeping this web-site, I will be visiting it. Do you do newsletters? Can’t find it. excellent put up, very informative. I wonder why the other experts of this sector don’t understand this. You should proceed your writing. I am confident, you’ve a huge readers’ base already! Great ¡V I should definitely pronounce, impressed with your site. I had no trouble navigating through all the tabs as well as related info ended up being truly easy to do to access. I recently found what I hoped for before you know it at all. Quite unusual. Is likely to appreciate it for those who add forums or something, website theme . a tones way for your customer to communicate. Excellent task..
Somebody essentially help to make significantly posts I’d state. That is the first time I frequented your web page and so far? I amazed with the research you made to make this particular put up amazing. Fantastic task! you’re in reality a good webmaster. The web site loading pace is incredible. It kind of feels that you are doing any unique trick. Furthermore, The contents are masterpiece. you have performed a wonderful activity on this topic! Thanks , I’ve recently been looking for information approximately this subject for a long time and yours is the best I’ve found out till now. However, what concerning the conclusion? Are you positive in regards to the supply? I simply want to tell you that I am just very new to blogging and site-building and seriously liked your web site. Almost certainly I’m going to bookmark your blog . You amazingly have wonderful article content. Bless you for sharing your website page. Hi there, I found your blog via Google even as looking for a comparable matter, your site got here up, it seems great. I’ve bookmarked it in my google bookmarks. I precisely desired to thank you so much yet again. I’m not certain the things that I could possibly have tried in the absence of the ideas discussed by you on such industry. It actually was an absolute troublesome scenario in my circumstances, however , coming across your expert manner you solved it forced me to leap with fulfillment. Now i am grateful for your help and in addition believe you comprehend what an amazing job your are undertaking training others thru your website. Most probably you’ve never encountered all of us. Aw, this was a really nice post. Taking the time and actual effort to produce a very good article… but what can I say… I hesitate a whole lot and don’t seem to get nearly anything done. Thanks for every other informative site. Where else may I am getting that kind of info written in such an ideal way? I have a undertaking that I am just now running on, and I have been on the look out for such information. Hello, Neat post. There is a problem with your web site in web explorer, could check this¡K IE nonetheless is the marketplace chief and a large portion of other people will pass over your magnificent writing due to this problem. I’m looking for out what one of the most popular blogs are when it concerns news and also views as well as mobile phone stuff. I was more than happy to discover this web site. I want to to thank you for your time for this particularly wonderful read!! I definitely enjoyed every bit of it and i also have you book-marked to check out new things on your website. I not to mention my buddies came reviewing the nice techniques found on your web site and so the sudden came up with a terrible feeling I never thanked the website owner for those tips. The ladies became happy to see them and have now clearly been enjoying these things. I appreciate you for indeed being so accommodating and for considering this kind of decent topics most people are really desperate to learn about. My personal sincere regret for not expressing appreciation to you sooner. I’m just writing to make you be aware of what a excellent encounter my friend’s girl encountered visiting your webblog. She picked up so many details, not to mention what it is like to possess an ideal coaching style to get certain people without difficulty learn about specific problematic subject matter. You actually surpassed our own expected results. Many thanks for presenting the interesting, dependable, revealing and in addition cool tips on the topic to Julie. I¡¦ve read a few good stuff here. Certainly value bookmarking for revisiting. I surprise how much effort you place to make such a excellent informative site. Wow, incredible weblog structure! How lengthy have you been blogging for? you make blogging glance easy. The total glance of your website is wonderful, as well as the content! Great post. I was checking continuously this blog and I am impressed! Very helpful information specifically the last part 🙂 I care for such info a lot. I was looking for this certain info for a very long time. Thank you and good luck. Hello, Neat post. There’s a problem together with your web site in internet explorer, may test this¡K IE nonetheless is the market leader and a good portion of people will leave out your great writing due to this problem. What are some good Tumblr blogs that enable you to submit images, to obtain even more fans?